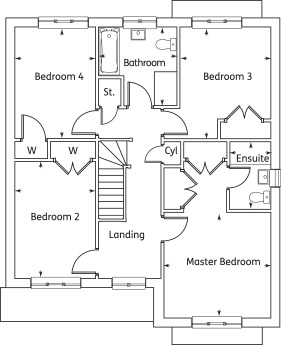 Kitchen 3.74m x 2.97m 12’3” x 9'9"
Utility 1.80m x 1.70m 5'11" x 5'7"
WC 1.85m x 1.70m 6'1" x 5'7"
Ensuite 2.39m x 1.42m 7’10” x 4'8"
Bedroom 2 4.11m x 2.82m 13’5” x 9'3"
Bedroom 4 3.92m x 2.82m 12’10” x 9'3"
Bathroom 2.77m x 2.75m 9’1” x 9"
The Tummel is a 4 bedroom detached villa. 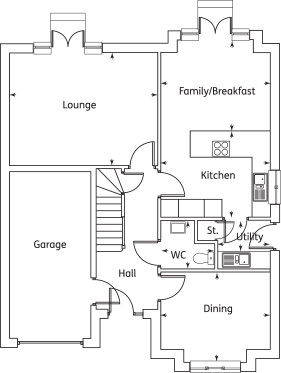 The ground floor comprises of the family/breakfast room, utility room, WC, lounge, dining room, main hall and garage. The upstairs of the villa has all 4 bedrooms, master with ensuite, bathroom and hall.